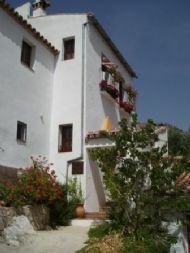 Charming village house to rent in Montejaque; a typical Spanish ‘white village’. 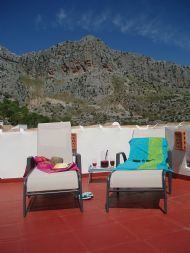 Built in the local Andalucian rustic style our house is situated in the unspoilt pueblo blanco (white village) of Montejaque located on the edge of the Sierra de Grazalema Natural Park and about 15 minutes drive from the historic town of Ronda. Casa ‘Santa Maria’ comfortably accommodates up to 4 people but for a couple we offer a reduced rate. The house is situated in the old (upper) part of the village called ‘Castillo’ where the narrow winding streets reflect its Moorish history. ‘Castillo’ is a mainly pedestrian area giving us peace and tranquillity since it is rarely disturbed by noisy village traffic. For visitors seeking an active holiday the area provides opportunities for walking, cycling, rock-climbing, trekking and other outdoor pursuits. On our doorstep is the unique Grazalema Natural Park. During autumn and spring Montejaque is an ideal location for bird-watching; spring and early summer it is a joy for botanists. Inspiring scenery and quaint local houses provide limitless subjects for artists to capture the essence of this lovely area. Casa ‘Santa Maria’ is also an ideal base for sightseeing from which to access the jewels of Andalucia. Within easy reach is the historic Moorish stronghold of Ronda with its famous El Tajo gorge and bullring. The cities of Cordoba, Seville, Jerez, Granada and Gibraltar; the undiscovered Costa de la Luz, with its beautiful beaches and interesting towns of Tarifa and Cadiz, are all accessible as day trips. The cosmopolitan resort of Marbella and the Costa del Sol are about an hour away. Enjoy these delights, then return to the comfort of Casa ‘Santa Maria’ to refresh yourself and prepare for your next adventure – or just chill out and recharge your batteries!